As a captain and batsman, you rarely seem fazed by the match situation. Where does that come from? It's coming [from] within myself, I think. I don't really blow out my emotions. I just try to absorb it and I try not to be too harsh or rude to the players on the ground because after all, we all make mistakes. We must appreciate all the hard work the players do, so I keep all the emotions to myself. As a batsman it has been coming to me since the age of 16, I suppose. I used to captain the Under-15s, Under-17s and Under-19s, so I've got this thing in my head saying that when I'm batting, especially, I should carry on till the end. I should not give my wicket away, because I'm a sort of a player who can always catch up. I don't really mind taking a few balls to get set. Because I'm batting at No. 5 or 6 it means I have to finish up games more often than not. It's not easy. You can't say I'm not under pressure. There's a lot of pressure when I go to bat, and a bit of nervousness. There are butterflies in your tummy but it's just that I actually don't blow away my emotions. Would you say that you've got more self-belief than the average cricketer? No. Most of the players do believe in themselves. I'm one of those. I believe in my ability. I'm not into personal goals. I want my team to win all the games, so I do whatever it takes for the team to win. How do you think becoming a captain at 25 has affected your game? I think it has affected it in a good way. I've taken more responsibility, I think. I mean, I used to be a very free-flowing scorer, and sometimes as a captain I tend to take a lot of responsibility and reduce the risk. Whereas when I first came in, even in a Test, I used to just jump out of the crease and slog a few sometimes. I think I've improved quite a bit in that way. You've got a lot to focus on with the captaincy and your own batting. How do you see yourself as a bowler in the future? I think it's all about managing yourself. I've been hit by a few [batsmen] in the past. That has nothing to do with my bowling. If I'm fit I try to bowl as much as I can. The schedules we have now, we hardly have any time to rest and have a few days off. You need to manage yourself, and you might have to reduce a bit more bowling and training, and you might have to do a bit more gym work. So I'm doing everything possible to keep myself fit. Mahela Jayawardene has said that the biggest priority as captain is ensuring you contribute as a player. Is that something you agree with? Yes, definitely. As a captain you're not only going there to handle the team in the middle, you play a major role in performing as well, have a bit more authority within the team. I agree with that. You need to perform as a captain and try and stamp your authority on the team. You have more respect when you perform. I just want to be as consistent as I can. I don't have huge goals in mind but I want to be the best allrounder in the world. I'm working hard trying to get there, but I still have a long way to go. I've gotten into a routine where I feel I'm giving myself the best chance to perform well in the middle. In the past you've spoken of a difficulty in converting fifties into hundreds. After your 157 not out in Abu Dhabi, do you feel you've resolved that? You need to concentrate really hard. Sometimes when you bat with the tail you have to play shots. If you get set with another batsman, you can go for some runs. But you need a lot of concentration for that and I think I'm working really hard on that. That's the secret for a batsman. I mean, when you saw Mahela in this series, in the first Test he failed and I thought his comeback was brilliant. All of us can learn something from that. The guy is so mentally tough. He's a tough character and the way he went about things was amazing. Self-belief, having confidence in the team, killer instinct, and also not giving up. Those are the things that you need to have as a player and as a captain, because we all know how hard Test cricket is. You need to fight your way through all the time. You get those phases where you feel like you can't handle it. But you need to hang in there. You need to fight it out and ultimately you'll be the winner. "I just want to be as consistent as I can. I don't have huge goals in mind but I want to be the best allrounder in the world"
You've shown those fighting qualities, in ODIs especially. Where does that come from? I believe in myself. I try to fight all the time. Especially when the pressure is on, you need to keep fighting. We as players sometimes just give up. Being able to fight is one of the things that's in me. What do you think are your strengths as a captain? As a captain you need to listen to people. I don't think you can handle each player in the same way. To help players you need to understand what they say and try to get the best out of them the way you want. Are there leaders you admire, and if so, why? I was just a little kid when Arjuna Ranatunga was captain and I used to watch him on TV and he used to stand with authority. He used to be a great leader. 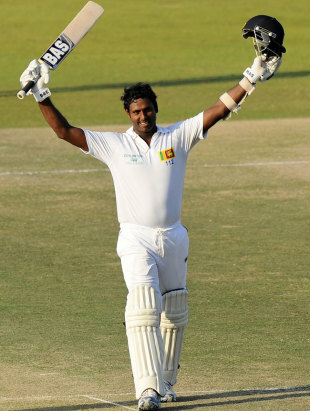 He is one of the best leaders that Sri Lanka has ever produced. Also Mahela and Sangakkara, the way they handle stuff. When it comes to player management they are pretty brilliant. What have been some of the biggest lessons for you in your 11 months as captain? Again, it's to do with player management. With players, you can't put your foot down and say, "You should do this. You should do that." As a captain you need to be able to listen to them. You need to be able to talk them through whatever they want to talk, and try and get the best for the team. Mahela and Sanga are great resources to have in the team. How have you used them? I get a lot of advice from the seniors, Dilshan, Mahela, Sanga, and when it comes to bowling, Lasith Malinga, Nuwan Kulasekara and Rangana Herath also give their opinions. But when it comes to decision-making, it's me and the coach. It doesn't really matter if they're seniors or juniors. You should be able to get their ideas as well. There will be instances where a junior comes to you and says something very important and you need to be able to listen. You took charge at a time of upheaval around the team, and there was a contracts crisis before you played your first Test as captain. Did that affect the way you looked at the job? No, not really. When it comes to the players, when they pass that white line, when they get out onto the field, we just want to win. It doesn't really matter what happens outside. Sri Lankan captains haven't had long life spans recently. Is this a job that you'd like to do for a long time? I haven't planned anything as such. I'm just enjoying my stint currently. The future is totally up to the selectors. I have no personal targets when it comes to captaining. I just want to do my best for the country and have the team win all the time. What are some aspects of Sri Lanka's team culture that you feel are vital and want to protect? We enjoy each other's success, and that has been the biggest part in our cricket. The culture is so different to other countries. We help each other out. The bowlers help the batsmen, the batsmen help the bowlers. So we all work for one target and it's about winning. We help everyone all the time and we drag everyone with us. In what ways do you mean the culture is different from other countries? I really haven't been part of other teams, but in most teams there might be instances where they go for individual goals, individual targets, whereas our team is all about winning. It's all about the team. Team comes first before any individual and that has always been our policy. That's the best thing that I like about my team. Sri Lanka's international schedule has come under huge threat from the domestic T20 leagues in the past few years. How can Sri Lanka deal with those challenges? As players we can't decide on anything. It's totally up to the cricket board and the tour organising committee. We've signed the contracts and we are obliged to our contracts. Whatever the board decides, we have to do it, and as players it doesn't worry us at all because we want to play for the country and when we go out there it doesn't really matter if it's some other big tournament. Others in the team have spoken out about not having enough Tests. Yes. Test cricket is the ultimate form of cricket and we'd like more of them in our calendar. We've got a few coming this year as well, and we hope that we'll be winning more Tests. The selectors are grooming a leadership unit, with Dinesh Chandimal and Lahiru Thirimanne being looked at as future leaders. How has splitting the captaincy affected the way you lead in ODIs and Tests? I haven't even thought of it because when it was announced that I was the Test and ODI skipper I said to myself, "You've been given a great responsibility and you have to live up to your expectations." So I'm not really looking at captaining all three formats or just one format or whatever because the selectors decided what's best for me and I've got to go with that. But I exchange ideas with Chandimal and Thirimanne. They are two great players and they think about it in a positive way and also have a lot of ideas. What are the major challenges for the team in the coming years? There are so many tours coming up and I think we would like to be in the top three in Tests and ODIs. We've got to work really hard towards getting there. It's not easy because all the teams are quite even and you have to have that slight mental edge to win against all opponents. All the tours are tough and it's going to take a lot out of us if we have to keep winning.